Hugo – Directed by Martin Scorsese, this is the movie based on Brian Selznick’s novel The Invention of Hugo Cabret. War Horse – I read the book by British author Michael Morpurgo a few years ago. And then last month my husband, son and I went to see the play at Lincoln Center in New York. Both were wonderful. Can it be three out of three? This one doesn’t open until mid-January so maybe there will be time to read! Advance warning: bring tissues. The Adventures of Tintin – Based on the adventures of the fictional Belgian reporter and his dog Snowy. Herge, the author of the 23 Tintin stories, died last December at the age of 98. Directed by Steven Spielberg, this one sounds promising. The Muppets – I know, the Muppets are not well known literary characters, but you have to love Kermit. If you want to be a purist about this and read a book before seeing the movie, check out: Frogs are Funny! The Most Sensational, Inspirational, Celebrational, Muppetational Muppets Joke Book Ever! You could also introduce your children to the creative mind behind Kermit and Miss Piggy by reading Kathleen Krull’s wonderful picture book biography, Jim Henson: The Guy Who Played with Puppets. I began to write an e-mail to a friend this morning and quickly changd my mind. It occurred to me that the book list I wrote for her might be interesting to other readers, so I decided to respond via my blog. My friend teaches elementary school, and she plans to open the school year with a discussion of role models. That’s a tough one today, isn’t it? It seems like every time a public figure is held up as a paragon of virtue, it falls apart. Think Tiger Woods. On the other hand, that’s a great lesson for kids. People are complex, and understanding that every person has both positive and negative attributes enriches their stories. What I love about school units that focus on heroes and heroines is that they show children what’s possible and how to persevere through challenges. Kids embark on a creative process every time they open a biography. While reading about another person, they are feeding their imaginations, and engaged in the work of constructing an identity. Reading is hardly a passive activity. While a student is reading, they are not only learning something new, they are figuring out who they are, and identifying what’s important to them. Most of all, through their reading, they are seeing themselves in relation to a bigger world. They are beginning to understand where they fit into their families, their neighborhoods and their world. One more thing….it occurred to me when writing this list that it’s time for a children’s biography about Paul Farmer, the American physician and anthropologist. I hope it’s being written right now. 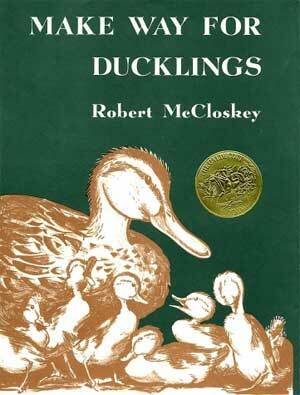 Make Way for Ducklings by Robert McCloskey – What is there to say? I looked at it last night and was charmed all over again by the Michael (the police officer) stopping traffic so that Mrs. Mallard and her ducklings can cross the street. You Can’t Take a Balloon into the Museum of Fine Arts by Jacqueline Preiss Weitzman – I chose this (and the next) book for the lively pictures of Boston. This one serves as a tour of Boston and an introduction to works of art like Copley’s iconic portrait of Paul Revere. Journey Around Boston From A to Z by Martha Zschock – Another charming tour of Boston. Beneath the Streets of Boston: Building America’s First Subway by Joe McKendry – This is a fascinating look at America’s oldest underground system. The Brothers Kennedy by Kathleen Krull – This is a brand new book by the prolific and talented Kathleen Krull. I like its emphasis on all three Kennedy brothers and its inspirational message. No Easy Way: The Story of Ted Williams and the Last .400 Season by Fred Bowen – This is also a new book. I certainly didn’t want to send our visitors back home without a book about one of Red Sox Nation’s stars!